Sun Mountain started the golf push cart revolution with the original Speed Cart V1. Their latest innovation is the Sun Mountain Micro Cart, scheduled to start shipping in late 2008. 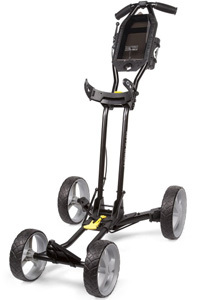 The Micro Cart will be the lightest and most compact folding golf push cart yet. At a feather light 12 pounds, and folding to a compact 24.5″x16″x12″ size, the Micro Cart will be any easy choice for those who have struggled to load and unload their push cart to and from their car. Don’t be fooled by the lightweight design, the Sun Mountain Micro Cart is fully featured. With Sun Mountains track record with golf push carts, the Micro Cart is surely going to shake up the push cart category once again.